The Solstice Season has arrived and we are entering a great period of transformation in the collective psyche of humanity. Very few human beings realize how cut off they are from the power of their most important faculty of expression - the Creative Imagination. The Creative Imagination is the true expression of the Divine Feminine in our consciousness and it is fueled by the power of Divine Love. In these times, we face many changes that are expected to occur in our World. We see them happening already in our headlines and in our lives. It is the Creative Imagination that is going to birth the New Earth and activate the process of Ascension. We have to imagine it to take part in it consciously. We must let go of the old ways of "thinking" about things and start to engage the greatest gift that we have been given to create as gods and goddesses. A gift that transcends the limitations of time and space. As we enter the June Solstice portal, we have Venus in Leo conjunct the North Node of the Moon and Mars in Aquarius, preparing to retrograde, conjunct the South Node of the Moon. The North Node and South Node represent the Dragon's head and tail in Vedic Astrology. The head, Rahu is the North Node, and the tail, Ketu, is the South Node. Venus, Mars, the Moon and the Sun are all important archetypes of the Creative Imagination - Venus being the heart, the feeling force and image maker of our reality. Venus in Leo is in her most alchemical sign. In Leo, Venus transmits the Christic force to Earth. Leo is pure creativity and heart of the Lion. Venus is conjunct the North Node of the Moon showing us that we are to activate her gifts as we move through the powerful energies of Solstice. Mars stationing retrograde conjunct the South Node, is being regenerated and transformed in the Aquarian energies of the coming Age of Aquarius - The Age of the Heart. Mars is getting a make over that will extend into the weeks ahead during the eclipses and Lion's Gate Portal. Mars represents power, aggression, sexual passion, and the fire of the Shakti force. This power has been inverted and used to harm and create war, rather than to heal and explore our true spiritual power. Mars is a very royal vibration when accessed through the higher octave of wisdom. It's primal power is positive when we are awake to our gifts and our true purpose on Earth. Venus and Mars are opposite each other at Solstice birthing their new relationship for the Age of Aquarius as we enter the last eclipses in Leo and Aquarius. Venus is calling to all of us. She has been bound to the lower density of consciousness as humans have not understood their own power to create their reality with love. The archetypes are inseparable from our collective psyche. They mirror to us what we are projecting and can activate our awakening when we tune into their powerful relationship with the Limitless Light of the Galactic Heart. 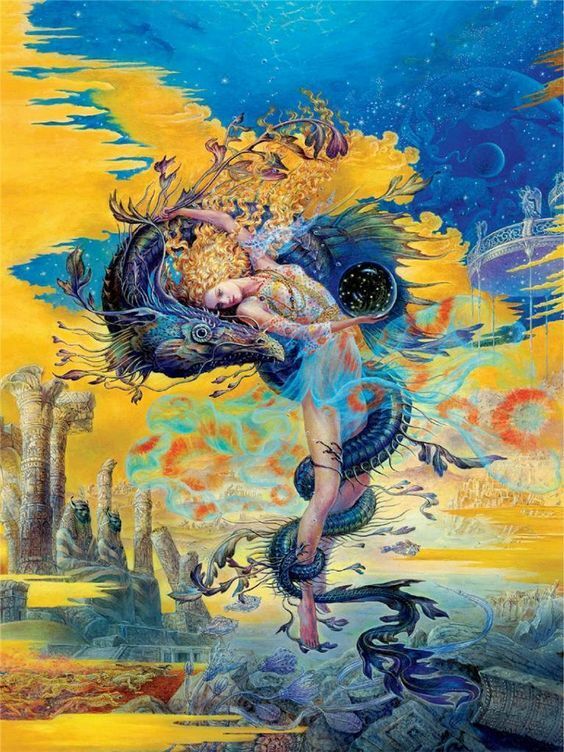 The Dragon is the substance of the Creative Imagination and Venus is it's activator. Together they are the energies of creative power and love. The Dragon rules over water, the Moon, and Venus rules over the shape that substance (Akasha) takes through our desires. They are the feeling, sensing and emotional Ether of the Dream. t's time for all of us to take a new direction in our ability to create our reality. Every one of us has a very crucial role to play at this time. We each have something to create, invent or imagine that will have an enormous effect on the way things evolve in the next seven years. It's time to wake up and create. Rather than trying to fight or take down the old system, CREATE THE NEW SYSTEM. We need to see the the fallen ways and then toss them asside and get busy! We can activate human consciousness and create a tidal wave of movement with the Dragon's force behind us! USE YOUR MOST POWERFUL RESOURCE TO DREAM A NEW REALITY. THIS IS OUR ASCENSION! The soul who is creating from the heart is a happy and determined soul and is given much help from the Ocean of Life. The positive energies of Divine Love are awakened in the one who creates from their own power. We are living in a disempowered reality that has been hacked by the thought forms which have been projected from our lower emotional body. All of Life is energy. As co-creators we are in school to learn how to run our energy so that we can be god-like and royal in our ways. Dream big or small and act on your dreams. It makes no difference who you are - we all have the same Gift and the same Creative Imagination of the Divine Feminine. The most surprising achievements can come from the meek and the humble. We are entering the Age of the Heart which means we are entering the Age of the Creative Imagination.